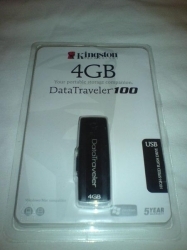 Kingston, one of the world leading companies for providing memory, has recently released their DataTraveler 100 (DT100) series of USB flash drives. 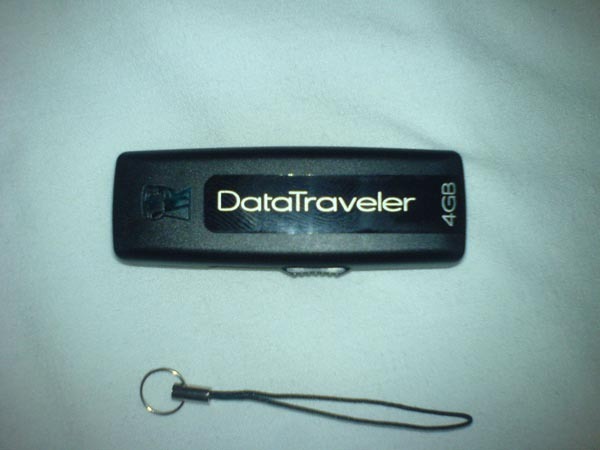 The Data Traveler is offered at 1, 2, 4, and 8GB capacities. These flash drives are sleek and stylish, having a slide out USB port allows the flash drive to be constructed of one finished piece of plastic giving it its impressive looks and durability. The retractable USB Port is easy to use and makes the device smaller without having the need for a cap of any sort. If you are anything like me you lost the caps to USB drives on a frequent basis so the inclusion of a sliding USB port mechanism is a definite plus. Kingston’s DataTraveler100 was designed to simplify data transfer in which it does without using passwords or built-in software, this in turn reduces time required to transfer files from your computer or media device to the DT100. This plug and play device was designed to take full advantage of the USB 2.0 HiSpeed transfer rate. Its normal operating temperatures range from 32-140F and can be stored between -4-185F. The DT100 is also backed with a five year warranty just in case anything might happen to it. It is compatible to most all operation systems including Windows Vista / XP / 2000, Mac OS, and Linux, note that it’s compatible with vista but not the ready boot feature with vista. The Kingston’s DT100 is offered in various sizes ranging from one to eight gigabytes. For testing we transferred a few ISO images from our computer to several different flash drives we had laying around. The data set was of size 1.1GB’s. The results of the speeds and time, refer to the chart below. As you can see the DT100 transfers the 1.1GB in 4:50 minutes where the PNY comes in at a lethargic 7:30 minutes and the Corsair blazes through the 1.1GB in 1:30 minutes. Clearly not all flash memory is equal and for the price the 4GB Kingston DT100 provides good performance. The DT100 is ideal for storing media and non security vital information or picking up a file encryption program. The DT100 is great for easily transferring files from one system to another at high speeds. and perfect for its price range. Without much security, I wouldn’t recommend using it to hold sensitive data, which for that purpose I would suggest the Kingston Data Traveler Secure or the Corsair 8GB Survivor GT Flash Drive which uses AES-256 Encryption, you can find our review here. Overall the DT100 offers style, function, and affordability at a very cheap $50 for the 4GB version. The 1GB is priced at $20, 2GB is priced at $35, 4GB at $50, and the 8GB at $100. Overall I would recommend this product for its large capacity and low price. 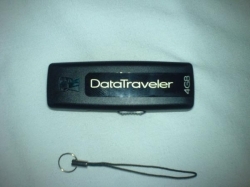 I have Kingston 4GB DataTraveler 100. May I make a bootable pen drive using this one?